Whether it’s live or in the studio, I love singing background vocals for another artist. I’ve had the pleasure of singing on some great studio recordings and in live situations. Some of the highlights of my “BG” singing career are singing with Loverboy at The Commodore Ballroom and Raising A Little Hell with Trooper in Nunavut under a full moon on a September long weekend. Does it get any more Canadian than that? It’s always a my-face-is-going-to-hurt-tomorrow good time to be on stage with John Delaney and The Indestructibles too. 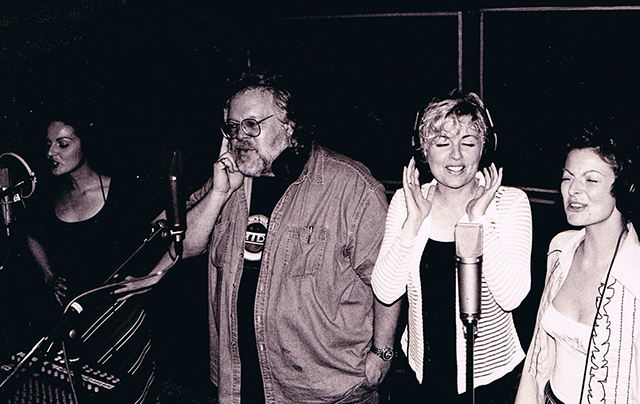 This is Farmer’s Daughter in the studio with Randy Bachman, recording a cover of BTO’s “Let it Ride” for our album called “This is the Life,” and it certainly is.